In the fight to stop global warming, Massachusetts used to lead the rest of the U.S. But Governor Charlie Baker moves us further backward every day. Baker talks loudly about protecting our air and water – while quietly eliminating environmental protections and helping corporate polluters skip out on their responsibilities. 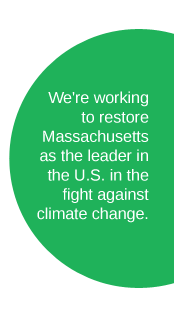 We're working to restore Massachusetts as the leader in the U.S. in the fight against climate change.